I bought a set of the large rings last year, and spliced me up a set on a length of 3/4" Tenex Tec. I have used them a few times, and can tell a difference in the shock-loading of large pieces vs using a block. I know a lot of folks have gotten into using rings, and wondered if there is any drawback to them. I'm pondering getting another set (likely medium this time), and splicing a double set onto a whoopee sling. Here's the one I spliced up last year, along with the rigging thimble I spliced up. Got a single large ring on a whoopie and a small x ring on an ultrasling. Cons I guess would be not midline attachable, and they can get hotter than a block ever would. Haven't heard of them getting hot enough to damage the sling, but can glaze a rope. A little friction in the canopy is usually a good thing IMO. Means ultimately a little less friction on the lowering device. Of course a porty can also glaze a rope under the right conditions too. Blocks are better for lifting with GRCS or mini or whatever. Pros are weight, mass, cost, and not worrying about breaking it when I chuck it to the ground. 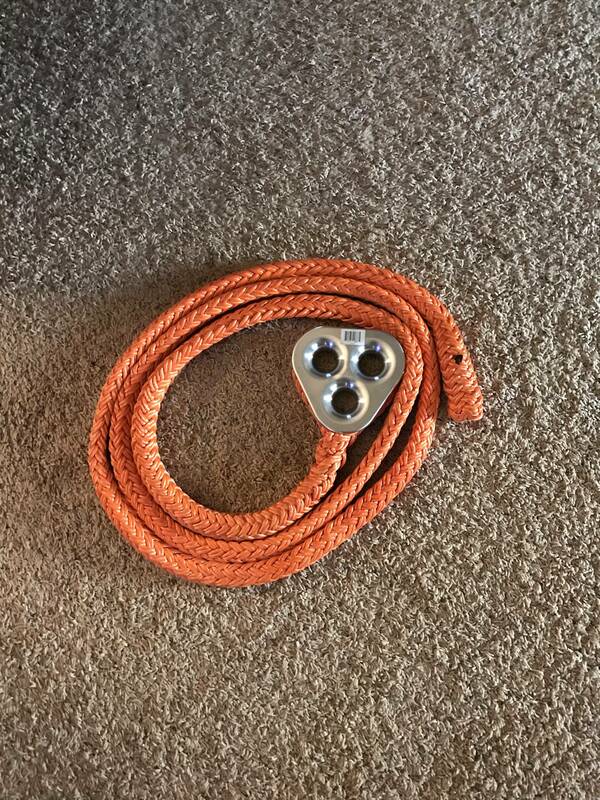 Awesome piece of rigging gear. That sums it up for me Jonny, since I bought my big ring I haven’t used the block. since I bought my big ring I haven’t used the block. Thanks, Cory. I missed that thread. I am wishing I'd made it a whoopee instead, as it's slow to tie/untie every time it's moved when blocking down big wood. The rigging thimble did nicely the one time I've used it. We rigged down some 400#-500# red oak chunks, and it did well. Yeah its interesting, when I used a block exclusively, it was on 12' of 3/4"tenex. To start a typical removal, I'd tie it high into approx 4" diameter wood, use it to take out all the brush and a lot of the wood and then retie it lower into thicker wood where the beefy and long tenex was perhaps a bit more needed. 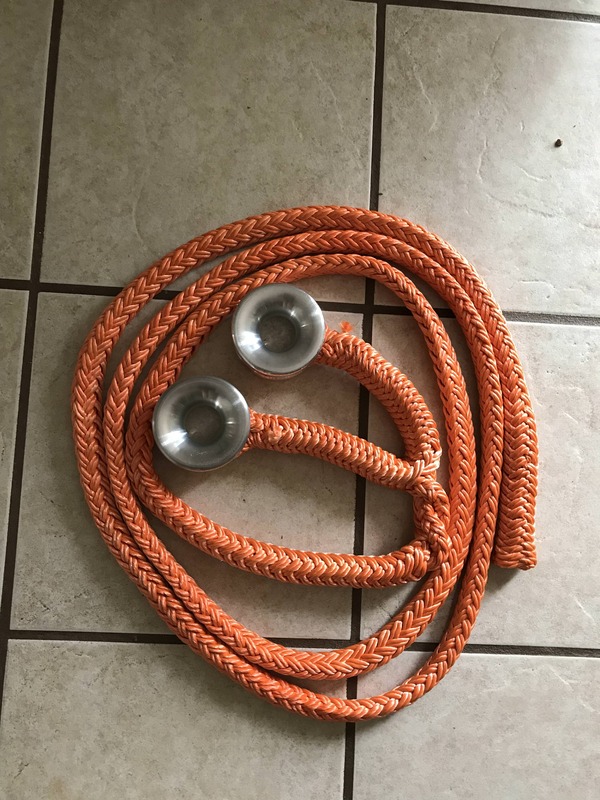 But once I started using the double ring on a short length of 3/4"double braid, I realized I was regularly and quickly girth hitching into that initial high tie-in point with the rings and the 12' length of tenex on the block was unneeded probably 85% of the time. Bottom line was faster installation on every movement. I'm ready and eager to use a block when it is called for but have been doing a lot of big removals since that earlier thread and haven't used the block since, for lowering. I made this one up a few years ago along with a couple of cambium save type small ones. I rarely use them tbh and I like a Krab in the rigging line and it is a pain to untie some times. The one in the pic is two beast rings and an XL spacer. Hey Rich, hows the martial training been going? ... I am wishing I'd made it a whoopee instead, as it's slow to tie/untie every time it's moved when blocking down big wood.